Sure I like Kate Spade. Okay I'm a little obsessed with Kate Spade. From the clothes to the shoes to the quirky bags she comes out with each season, it's all good in my book, but sometimes the price tags are a bit much, especially for select items that never make it to the sale rack. Today's outfit has Kate Spade written all over it, but none of it is actually Kate. The dress is a dead ringer for the Kate Spade Vivien dress which I drooled over for quite sometime. When it finally went on sale, plus an extra 20% off it was sold out in my size. Lucky for me a couple of months later I came across this similar version by Betsy Johnson at Marshall's. It was a fraction of a price and just as cute, if not quite as nice. 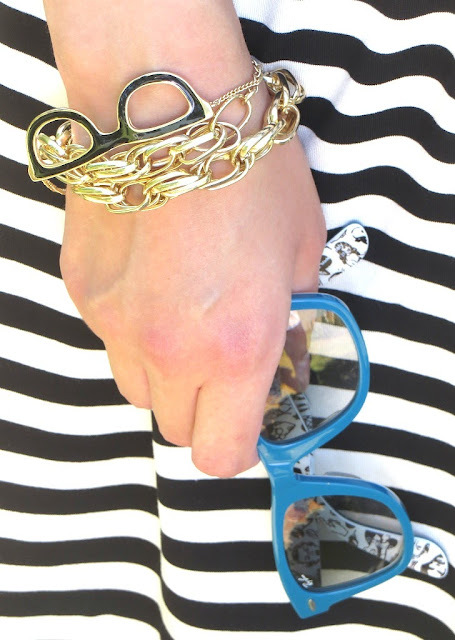 This bracelet featuring a pair of specs, is also very Kate. The Kate Spade version retailed for $78, but mine was only $7 from ASOS. While I love all of the cute pieces of jewelry featuring glasses, mustaches and other quirky icons, let's face it, they won't be trendy for long and will surely be replaced by something else down the road. Why not save a little cash and buy the cheaper version? Sorry Kate! So as you can see, this outfit is a doppelganger for Kate Spade but at a fraction of the price. While it's not quite Kate Spade it is totally Katie and that's all that counts! What a cute outfit! I think I actually like the BJ dress better, the top portion seems to lay better whereas I felt the KS version seemed a little too bow-like uptop, which can sometimes look a bit costume-y. I love the pops of color you added and the great details! Thanks Lisa! I feel that this version is a little more casual due to the fabric and as you pointed out less costume-esque. I actually think I'll get more use out of it than the KS version. The little cutout section on that dress is just too cute! Lovely outfit Katie! You look great! 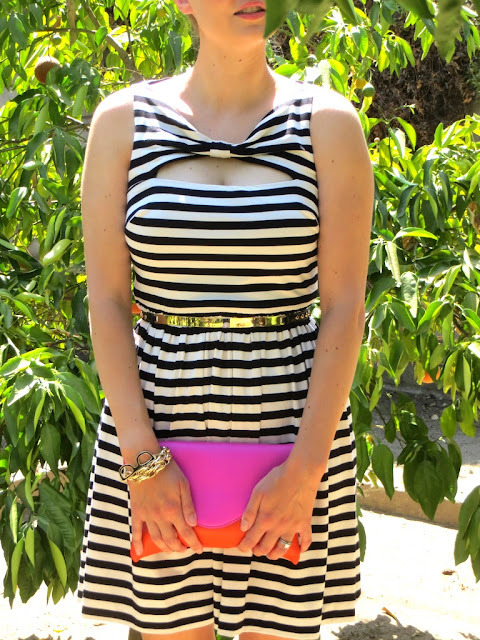 I have a ton of striped stuff, dresses included so the cutout is what really sold me on this dress. Thanks Laura!